Table 1. Nutritional criteria for food and drinks offered at schools according to the Consensus Document on School Food of the National Health System. Table 2. Mean nutritional content of food and drinks products offered in vending machines at secondary schools in the Madrid Autonomous Community, 2014-2015. Table 3. Percentage of global non-adherence to the Consensus Document on School Food criteria in food and drinks offered in vending machines at secondary schools in the Madrid Autonomous Community, 2014-2015. Table 4. Comparison of percentage of non-adherence to the Consensus Document on School Food nutritional criteria between food and drinks offered in vending machines at secondary schools in the Madrid Autonomous Community, 2014-2015. To describe the nutritional content of products offered in food and drink vending machines at secondary schools in the Madrid Autonomous Community (Spain), and to evaluate these items’ adherence to the nutritional recommendations of the National Health System Consensus Document on School Food. Cross-sectional study of a sample of 330 secondary schools in Madrid across the period 2014-2015. Secondary school vending machines were identified by telephone interview. The products offered in a representative sample of six machines were identified by inspection in situ, and their nutritional composition was obtained from the labelling. A total of 94.5% of the 55 products on offer failed to comply with at least one nutritional criterion of the Consensus Document on School Food. The recommendation relating to sugar content registered the highest level of non-compliance, with 52.7% of products, followed by the recommendations relating to energy (47.3%) and fats (45.5%). The mean number of unmet criteria was 2.2, with this figure being higher in foods than in drinks (2.8 versus 1; p <0.01). Almost all the products on display in secondary school vending machines in Madrid were in breach of the Consensus Document on School Food, mainly due to an excess of calories, sugars and fats. Compulsory nutritional criteria and a procedure for monitoring adherence should be established, specifying those responsible for performing this task and the corrective measures to be applied in the event of non-compliance. 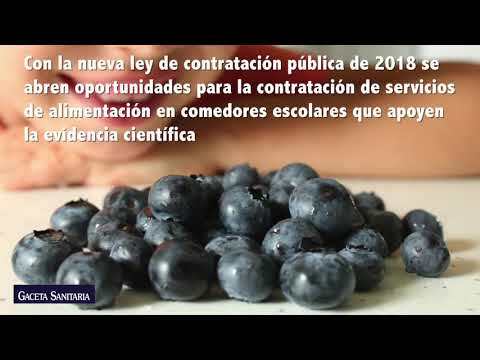 Describir el contenido nutricional de los productos ofertados en las máquinas expendedoras de alimentos y bebidas de los centros de educación secundaria de la Comunidad de Madrid (España), y evaluar su adherencia a las recomendaciones nutricionales del Documento de Consenso del Sistema Nacional de Salud sobre la Alimentación en los Centros Educativos. Estudio transversal sobre una muestra de 330 centros de educación secundaria de la Comunidad de Madrid durante 2014-2015. Las máquinas expendedoras se identificaron mediante entrevista telefónica. Los productos ofertados en una muestra representativa de seis máquinas se identificaron mediante inspección in situ, y su composición nutricional se obtuvo del etiquetado. El 94,5% de los 55 productos ofertados incumplía al menos uno de los criterios nutricionales del documento de consenso. La recomendación relativa al contenido de azúcares presentó el mayor grado de incumplimiento, con un 52,7% de los productos, seguida de las relativas a la energía (47,3%) y las grasas (45,5%). La media de criterios incumplidos fue de 2,2, siendo superior en los alimentos que en las bebidas (2,8 frente a 1; p <0,01). Casi todos los productos de las máquinas expendedoras de los centros de educación secundaria de la Comunidad de Madrid incumplen el Documento de Consenso, principalmente por exceso de calorías, azúcares y grasas. Se recomienda establecer criterios nutricionales de obligado cumplimiento y un procedimiento para monitorizar la adherencia a los mismos, con identificación de sus responsables y previsión de medidas correctoras en caso de incumplimiento. The causes of global childhood obesity are low physical activity, sedentarism and inappropriate diet, coupled with a high consumption of high-calorie, processed foods rich in sugars and saturated fats and poor in micronutrients, promoted by an unfavourable socio-economic environment.6,7 Spanish children consume processed products in excess, whereas the consumption of fruit, vegetables and legumes is inadequate.8,9 Furthermore, they have a deficit of fibre and complex carbohydrates and an excess of fats and sugars, accounting for 45.9% and 21.2% of total calorie intake respectively, far above the recommended values.10 Soft drinks, fruit juices and fruit drinks contribute from 5% to 6% total calorie intake of Spanish children and adolescents,11 corresponding to a mean consumption of around 200ml/day.12 Data from the Spanish National Health Survey shows that 17% of Spanish children aged 5 to 14 years consumed sugar-sweetened soft drinks daily in 2006, a figure that fell to 11% in 2011, after the 2008 economic crisis13. When looking at those children in the same age range belonging to the low socio-economic class, the figures for daily consumption of sugar-sweetened soft drinks where over 30% in 2006 and 17% in 2011. Childhood is a crucial period for preventing overweight and obesity, since it is then that dietary habits are formed which will endure into adult ages. Hence, the special emphasis laid on the childhood population by the Strategy for Nutrition, Physical Activity and Prevention of Obesity (Estrategia para la Nutrición, Actividad Física, Prevención de la Obesidad y Salud/NAOS) and the choice of a school setting as a one of the priority areas for intervention.14 One of the first initiatives was the 2005 Collaboration Agreement with the Spanish National Association of Automatic Vending Distributors (Asociación Nacional Española de Distribuidores Automáticos), aimed at impeding the access of primary-school pupils to food and drink vending machines, and improving the nutritional quality of the items on offer, including those that would contribute to a balanced diet at the expense of others with a high salt, sugar or fat content. In 2008, a study of Madrid primary schools reported negligible compliance with the agreement.15 In 2010, the National Health System Interterritorial Council (NHSIC) approved the Consensus Document on School Food (Documento de Consenso del Sistema Nacional de Salud sobre Alimentación en los Centros Educativos),16 which laid down school-canteen food guidelines and the nutritional criteria to be met by food and drinks offered in school cafeteria and vending machines. Many studies have assessed adherence to the schools’ meals recommendations by school canteens,17–20 but in a literature review we found no previous research focused on the products sold in food and drink vending machines in Spain. Accordingly, this study describes the nutritional content of products found in vending machines at secondary schools (Centros de Educación Secundaria) in the Madrid Autonomous Community, and evaluates their adherence to the Consensus Document on School Food recommendations. Of the 330 secondary schools, 57 (17.3%) had one or more vending machines, making a total of 93 such machines, with 23 (24.7%) selling food, 55 (59.2%) selling drink, and 15 (16.1%) selling a mixed range of items. In view of the similarity in the products sold by vending machines of the same type,15 which depends on the products available in the market at any particular time point, we decided to include the minimum number of machines possible in this study, while maintaining the distribution by type of machine (food, drink, and mixed) similar to that of the original sample. We thus obtained a subsample of six machines, made up of one with a mixed range (16.7%), due to this being the least frequent in the original sample, two with food (33.3%), and three with drink (50%). The machines were selected from schools of every ownership type, i.e., two from private, two from public and two from subsidised schools. The sample made up of the different foods and drinks drawn from the six machines forming the subject of this study totalled 55 items. From January to May 2015, the schools housing the six selected vending machines were visited after making an appointment with the respective head teachers. All the products in the machines were identified and photographed. Information on ingredients, calorie content and nutritional composition per 100g (foods) or 100ml (drinks) was obtained from product labels, as in the example in Figure 1. The calorie content and nutritional composition per portion was obtained by simple calculations with the portion size reported in the food packages. Where the nutritional information of any item was not visible and was not available on the company's web page, a sample item was taken from the vending machine. Example of nutritional content of a candy offered in vending machines at secondary schools in the Madrid Autonomous Community, 2014-2015. Nutritional criteria for food and drinks offered at schools according to the Consensus Document on School Food of the National Health System. Assuming packages or portions of 50g for solid foods and 200ml for drinks, which are the most common on the market. Percentage of total caloric intake content of the product. The products offered in the vending machines were classified as foods and beverages, according to the criteria in previous research on this topic.23 Like in a similar study in secondary schools in Ontario (Canada),24 we included water in our analysis. The nutritional content of the 55 food and drink products is shown in Table 2. The average portion size was 56.4g for foods and 267.2ml for drinks. Every portion of product provided a mean of 186.1kcal; of this, 31.1% came from sugars, 5.1% from proteins, 39% from total fats, and 14.8% from saturated fats. A comparison between these figures and the nutritional goals of the Spanish Society for Community Nutrition (Sociedad Española de Nutrición Comunitaria)27 and the WHO sugar guidelines,25 led to the conclusion that the products sold in the machines had an excessive sugar and fat (total and saturated) content and were low in complex carbohydrates. Mean nutritional content of food and drinks products offered in vending machines at secondary schools in the Madrid Autonomous Community, 2014-2015. Protein and carbohydrates are deemed to supply 16.736kJ/g (4kcal/g), and fats, 37.656kJ/g (9kcal/g). Most products (67.3%) were foods. Table 3 shows that 94.5% of products failed to comply with at least one of the Consensus Document on School Food nutritional criteria, with this percentage being lower for drinks than for foods (88.8% versus 97.8%; p=0.25). The two milk drinks were in breach of the Consensus Document (Bifrutas Tropical Pineapple and Pascual Chocolate Milkshake); and of the remaining drinks, only two (water and Aquarius Lemon) complied with all the nutritional criteria. Regarding foods, only a mixed sandwich met all the Consensus Document nutritional criteria. Percentage of global non-adherence to the Consensus Document on School Food criteria in food and drinks offered in vending machines at secondary schools in the Madrid Autonomous Community, 2014-2015. The criterion which registered the highest rate of non-adherence was that governing sugar, with more than a half of all food and drink products being non-compliant (Figure 2). When the stricter WHO guideline criterion was applied (<10% of total caloric intake from sugar), more than two thirds (69.1%) of the products were non-compliant. A total of 47.3% of products supplied more energy than recommended, and 45.5% of them failed to comply with the criteria governing total fat. The best performance was observed for the criteria of the salt/sodium and trans-fatty acids with non-compliance rates below 25%. Percentage of non-adherence to the Consensus Document on School Food nutritional criteria in food and drinks products offered in vending machines at secondary schools in the Madrid Autonomous Community, 2014-2015. Whereas the rate of non-adherence with nutritional criteria for foods ranged from 2.7% for artificial sweeteners to 70.3% for energy, drinks were only non-compliant in the case of sugars and artificial sweeteners, with rates of 38.9% and 61.1% respectively (Table 4). According to the WHO sugar guideline, non-compliance in foods was 73% versus 61.1% in drinks, though this difference did not prove statistically significant. Differences between food and drinks in terms of non-compliance with the Consensus Document criteria were statistically significant, except in the case of trans-fatty acids and sugar. Comparison of percentage of non-adherence to the Consensus Document on School Food nutritional criteria between food and drinks offered in vending machines at secondary schools in the Madrid Autonomous Community, 2014-2015. Associated with Fisher's exact test statistic. A total of 40% of products failed to comply with only one of the Consensus Document nutritional criteria, whereas 27.2% breached four or five criteria out of a total of seven. The mean number of unmet criteria was 2.2 (95% confidence interval: 1.85-2.62), with this figure being higher in foods than in drinks (2.8 versus 1; p <0.01). This study shows that the products sold in secondary schools vending machines in the Madrid Autonomous Community have a high energy content, with sugars and fats being responsible for the highest caloric contribution. A total of 94.5% of products were in breach of at least one of the Consensus Document on School Food nutritional criteria, with a mean of more than two unmet criteria per product. The criterion registering the highest non-compliance rate was that of sugar (52.7% of products), followed by energy (47.3%) and fats (45.5%). The proportion of non-compliance was greater in foods than in drinks, both overall and for all the criteria analysed, with the single exception of artificial sweeteners. A similar study covering Madrid Autonomous Community primary schools in 2008 showed that only 10% of vending machine products complied with the recommendations of the then prevailing agreement between the government authorities and Spanish National Association of Automatic Vending Distributors,15 as compared to 5.5% of those that met all the Consensus Document on School Food criteria in this study. Although the figures are not directly comparable, in that they are based on different criteria, both studies reveal the high prevalence of energy-dense, nutrient-poor foods in vending machines at Madrid schools. In a previous analysis of the data from this study using the United Kingdom Nutrient Profiling Model,28 as few as 19.5% of products were classified as healthy. This is mainly due to the fact that the UK nutritional profile permits a product containing artificial sweeteners to be as healthy, provided that the remaining ingredients conform to the model.21 Another Madrid primary-school study in 2009, which also analysed the range of items offered by school cafeterias, found that this was dominated by soft drinks, bottled, canned and packaged juices, and industrial cakes and pastries.29 Similar results were reported at an international level,30–32 where vending machines mostly contain energy products, rich in fat, sugar and salt, and poor in micronutrients and fibre. The criterion to display the lowest adherence was that governing sugar, in that over half the products exceeded the established limit. In terms of WHO guidelines, non-compliance was 69.1%. This is due to the fact that, whereas the WHO recommends limiting consumption of free sugars to 10% of total calorie intake,25 the Consensus Document on School Food permits three times more, arguing that most of the products on the market have a high sugar content and that application of the WHO criterion would lead to vending machines being left unstocked. However, the Consensus Document on School Food itself saw such flexibility as being temporary, setting a provisional limit of 30% that would spur producers to reduce the sugar in food and drinks.16 Yet, five years after its publication, sugar content continues to be excessive, even by reference to lenient criteria such as those of the Consensus Document on School Food, and the practical totality of the food and drinks on offer are in breach of one or more of its criteria. The industry has not advanced in terms of reformulating its products to improve their nutritional profile. In the European Union, school food policies vary widely among countries. Whilst in France and Denmark vending machines are banned at schools, Austria, Portugal and Scotland prohibit the marketing of unhealthy products, and a third group of countries only issue recommendations about products to be offered in vending machines.45 This latter group includes Spain, which has issued a series of recommendations that the Autonomous Communities may or may not implement. Added to this is the fact that little is known about the Consensus Document in schools17 and that there is a lack of qualified staff to assess the type of products being sold in the machines: indeed, the Consensus Document on School Food stipulates that the persons or companies responsible for supplying and servicing the vending machines are also to be responsible for checking that the products comply with the guideline criteria,16 thus leaving this decision in the hands of third parties with conflicts of interest. While the high percentage of non-response on the part of the secondary schools is a limitation of this study, the characteristics of the schools that agreed and those that refused to participate in the study were nonetheless similar.21 Furthermore, though the Consensus Document on School Food recommendations are applicable nationwide, the scope of the study was limited to the Madrid Autonomous Community, so the results might not be extrapolated to the rest of the country. The main strength of this study was that it is the first in Spain to evaluate adherence to the Consensus Document on School Food recommendations in secondary schools vending machines. Accordingly, it could serve as a reference for analysing the trend in the nutritional quality of such products and their degree of adherence to this Document in Madrid. The 2005 agreement between the food industry and the Spanish Health Department was not effective in promoting a supply of healthy food products at vending machines in schools. In 2010, the government approved a set of national recommendations with nutritional criteria for foods offered at schools. Almost no food or drink offered in vending machines at Madrid (Spain) schools follows the Spanish nutritional recommendations, being most products high in calories, sugar or fat. It is advisable to make nutritional criteria for foods at schools compulsory, and provide sufficient resources for their implementation and follow-up in order to guarantee its effectiveness. M.A. Royo-Bordonada designed the study. M.L. Jácome-González and M.A. Moya-Geromini participated in data-collection, -processing and -analysis. D.X. Monroy-Parada wrote the first draft of the paper with the help of M.L. Jácome-González and M.A. Royo-Bordonada; and F. Rodríguez-Artalejo made important contributions. All authors contributed to the revision and approval of the final manuscript. This project has been partially supported by the Spanish Health Research Fund of the Institute of Health Carlos III (Project ENPY 1015/13) and Asociación Madrileña de Salud Pública. The authors thank María José Bosqued and Lázaro López for her help in data collection and the contact with the schools. This article presents independent results and research. The views expressed are those of the authors and not necessarily those of the Instituto de Salud Carlos III. J.J. Sánchez-Cruz, J.J. Jiménez-Moleón, S. Fernández-Quesada, et al. T. Fleming, M. Robinson, B. Thomson, et al. R.R. Pate, J.R. O’Neill, A.D. Liese, et al. Factors associated with development of excessive fatness in children and adolescents: a review of prospective studies. B.A. Swinburn, G. Sacks, K.D. Hall, et al. F. Rodríguez-Artalejo, C. Garcés, L. Gorgojo, et al. Dietary patterns among children aged 6-7 y in four Spanish cities with widely differing cardiovascular mortality. J. Aranceta, C. Pérez-Rodrigo, L. Ribas, et al. Sociodemographic and lifestyle determinants of food patterns in Spanish children and adolescents: the enKid study. M.A. Royo-Bordonada, L. Gorgojo, J.M. Martín-Moreno, et al. Spanish children's diet: compliance with nutrient and food intake guidelines. E. Ruiz, J.M. Ávila, T. Valero, et al. Macronutrient distribution and dietary sources in the Spanish population: findings from the ANIBES study. I. Guelinckx, I. Iglesia, J.H. Bottin, et al. Intake of water and beverages of children and adolescents in 13 countries. Ramiro-González M, Sanz-Barbero B, Royo-Bordonada MA. Childhood excess weight in Spain from 2006 to 2012. Determinants and parental misperception. Rev Esp Cardiol. 2017 Mar 18. pii: S1885-5857(17)30096-8. [Epub ahead of print]. Estrategia para la nutrición, actividad física y prevención de la obesidad (NAOS). Evaluation of compliance with the self-regulation agreement of the food and drink vending machine sector in primary schools in Madrid, Spain, in 2008. B. Berradre-Sáenz, M.A. Royo-Bordonada, M.J. Bosqued, et al. Menú escolar de los centros de enseñanza secundaria de Madrid: conocimiento y cumplimiento de las recomendaciones del Sistema Nacional de Salud. Programa de revisió de menús escolars. Memòria 2006-2012. Estudio del menú en los comedores de Asturias. P. Uriarte, F. Larrea, S. Alonso. Características nutricionales de los menús escolares en Bizkaia (País Vasco, España) durante el curso 2012/2013. D.X. Monroy-Parada, M.A. Moya, M.J. Bosqued, et al. Presencia de máquinas expendedoras de alimentos y perfil nutricional de sus productos en los institutos de enseñanza secundaria de la Comunidad de Madrid, 2014-2015. B. Kelly, J.C.G. Halford, E.J. Boyland, et al. T. Orava, S. Manske, R. Hanning. Beverages and snacks available in vending machines from a subset of Ontario secondary schools: do offerings align with provincial nutrition standards?. Guideline: Sugars intake for adults and children. 2014 Stata Statistical Software: Release 12. Ll Serra Majem, J. Aranceta Bartrina. Confederación de Asociaciones de Consumidores y Usuarios de Madrid. Estudio sobre la oferta de bebidas y comida en máquinas expendedoras y cafeterías de los colegios de la Comunidad de Madrid. C. Byrd-Bredbenner, M. Johnson, V. Quick, et al. Sweet and salty. An assessment of the snacks and beverages sold in vending machines on US post-secondary institution campuses. K. Pasch, L. Lytle, A. Samuelson, et al. Are school vending machines loaded with calories and fat? an assessment of 106 middle and high schools. N. Cisse-Egbuonye, S. Liles, K. Schmitz, et al. Availability of vending machines and school stores in California schools. A.J. Rovner, T.R. Nansel, J. Wang, et al. Food sold in school vending machines is associated with overall student dietary intake. L.C. Mâsse, J.E. de Niet-Fitzgerald, A.W. Watts, et al. Associations between the school food environment, student consumption and body mass index of Canadian adolescents. J.P. Elder, C.K. Holub, E.M. Arredondo, et al. Promotion of water consumption in elementary school children in San Diego, USA and Tlaltizapan, Mexico. S.L. Mayne, A.H. Auchincloss, Y.L. Michael. Impact of policy and built environment changes on obesity-related outcomes: a systematic review of naturally occurring experiments. R. Muckelbauer, L. Libuda, K. Clausen. Promotion and provision of drinking water in schools for overweight prevention: randomized, controlled cluster trial. P.L. Kocken, J. Eeuwijk, N.M. Van Kesteren, et al. Promoting the purchase of low-calorie foods from school vending machines: a cluster-randomized controlled study. Y.C. Wang, D.S. Ludwig, K. Sonneville, et al. Modeling the effect of replacing sugar-sweetened beverage consumption with water on energy intake, HBI score, and obesity prevalence. M. Story, M.S. Nanney, M.B. Schwartz. Comprehensive mapping of national school food policies across the European Union plus Norway and Switzerland. A. Adamson, S. Spence, L. Reed, et al. School food standards in the UK: implementation and evaluation. S. Barquera, I. Campos, J.A. Rivera. Mexico attempts to tackle obesity: the process, results, push backs and future challenges.